Unearthed Cave Painting Of Wooly Mammoth, Saber-Tooth Tiger Reveals Humans Have Debated What Things Would Win In A Fight Since 30,000 B.C. 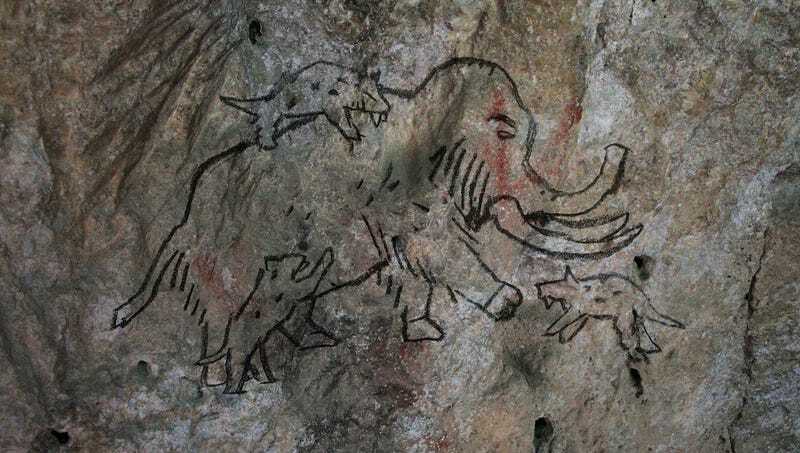 ARDÈCHE, FRANCE—Saying that the recently discovered figurative art sheds new light on prehistoric speculative conflict, archeologists working at France’s Chauvet-Pont-d’Arc Cave announced Friday the discovery of a 300-century-old painting of an adult European mammoth squaring off against five sabre-toothed tigers. “This well-preserved and surprisingly detailed illustration shows us that ancient humans, people we refer to as cavemen, were capable of surprisingly sophisticated thought and probing insight, asking themselves mankind’s oldest philosophical question: Who would win in a fight?” said prominent paleolithic art expert Dr. David Whitley, noting that it was only a small intellectual step from sabretooth-versus-mammoth to such fundamental human debates as Hercules versus Gilgamesh, double-size Muhammed Ali versus one-tenth-size Godzilla, and the 1996 Bulls versus the 2012 Heat. “It’s a question that has shaped and molded all of human history. Also, I don’t care what this cave painting says—the mammoth would totally prevail unless it got, like, stuck in a tar pit.” Whitley refused to comment on the discovery of a second, somewhat more realistic mural, which seems to ask the question of how many Cro-Magnons it would take to drive the Neanderthals extinct.